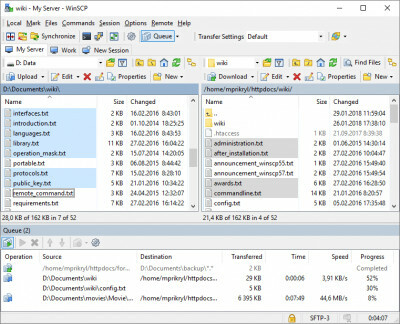 WinSCP 5.15.1 free download. Freeware SFTP (SSH File Transfer Protocol) and SCP (Secure CoPy) client for Windows using SSH (Secure SHell). WinSCP is a useful file transfer utility that will come in handy. Its main function is safe copying of files between a local and a remote computer. Beyond this basic function, WinSCP manages some other actions with files. Apache Ant is a popular tool created in Java that uses external 'tasks' or tools to provide a much greater degree of control over the software build and deployment process. This FTP client can handle file groups and allows you to change attributes of files stored on an FTP-server. Pablo Commander is a mixture between Norton Commander and Windows Explorer. Secure Copy is a file transfer tool that enables you to do local and network transfer with resume support. FTP Client Screen Saver is a free and useful screensaver for users of the BitKinex FTP client. WorkSoft Navigator is an alternative file managing utility for Windows OS. UniTTY is a multi-protocol client that provides you an impressive suite of connectivity applications in one easy-to-use package. RightFTP is designed as a free FTP client for Windows with wide range of features. Secure File transfer solutions to simplify your work. Transfer files easily using this powerful, yet intuitive FTP client for both advanced Web developers and begginer users alike. LinasFTP is a FTP client application that supports automatic resuming and will try to reconnect until the file is completely downloaded. Robust FTP is a Windows-based file transfer client application that transfers files between a user�s local PC and another, remote computer system connected via a modem and telephone lines or by a local-area network (With upload transfer resume and download transfer resume). BlazeFtp is a multiple-session and cache-enabled ftp client with built-in offline search engine.